2012 -- He jumped over 1,000 ranking spots to finish in Top 500 for 1st time. He won two back-to-back ITF titles in Mexico without dropping a set and finished as a runner-up at two ITF tournaments in Sweden and Serbia. 2013 - Pouille made his qualifying debut at Grand Slam level at Australian Open losing to Bemelmans in the second round. He made his ATP main draw debut in Montpellier (l. to No.7 seed Troicki). In his Grand Slam debut at Roland Garros, he posted his maiden Tour-level win over Alex Kuznetsov in the first-round (l. to Dimitrov). In 's-Hertogenbosch he qualified for the first time into a Tour-level event (l. to Chardy). He won two ITF titles and reached the semifinals at a Challenger tournament in Kazan. He was one of two teenagers alongside Kyrgios to finish the season in Top 200. 2014 - As a wild-card, he played the Australian Open and the Roland Garros, losing in the first-round to Lajovic and Monaco respectively. At the 2014 Paris Masters, Pouille entered the main draw and beat No. 27 Karlovic and No. 20 Fognini in the main draw (l. to No. 2 Federer). Afterwards, he jumped from No. 176 to No. 134. At Challenger-level, he advanced to his first career final in Meknes (l. to Coppejans), and he reached the semifinals in Szczecin, Arad and Kosice. At the end of the season, he was the youngest Frenchman in Top 150. 2015 - When he beat Thiem to reach the second round in Montecarlo (l. Nadal), Pouille broke into the Top 100. He played his first two ATP World Tour semifinals in Auckland (l. Mannarino) and Hamburg (l. Fognini), reaching his then career-high at No.64 on August 3. He also advanced to the quarter-finals in St. Petersburg and Moscow (l. to Bautista Agut in both). He played in all the Grand Slam tournaments for the first time and ended the season with a Challenger final in Mouilleron Le Captif (d. Stakhovsky and Mannarino, l. to No. 20 Paire). He finished the season at No.78, for his first Top 100 year. 2016 - He set career-highs this season in wins (34) and ranking (No. 15 on November 7). He advanced to his first ATP World Tour final in Bucharest (d. Lajovic, Karlovic, Lorenzi and Delbonis; l. to Verdasco) and became the 7th French champion in Metz in the last 8 years (d. No. 10 Thiem). At Grand Slam level, he defeated del Potro, and beat Tomic 10-8 in the fifth to reach his first Grand Slam quarterfinal at Wimbledon (l. to No. 9 Berdych). At Us Open, he won 5-setters over Chiudinelli, Bautista Agut and No. 5 Nadal en route to clinch his second straight major quarterfinal at US Open (l. to Monfils). He joined Monfils and Tsonga at 2016 US Open as 1st French trio to reach same Grand Slam QF in Open Era. At Masters 1000 level, he reached the round-16 in Miami (saved a match point to beat Ferrer, l.Simon) and Montecarlo (l.Tsonga). In Rome, he defeated Gulbis and No. 9 Ferrer, becoming the second lucky-loser to reach an ATP Masters 1000 semifinal after Johansson at 2004 Toronto ((l. to No. 3 Murray). He finished the season at N.15 and received the ATP World Tour Award for the Most Improved Player of the Year. 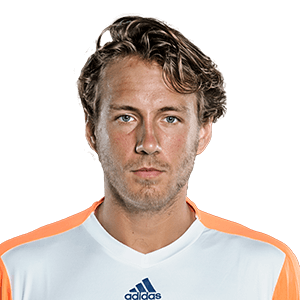 Tennis: Pouille was scheduled to play both singles and doubles in Rotterdam. Tennis: Also, David Goffin and Lucas Pouille set to play doubles in Rotterdam.